Bayer CropScience donation funds grain bin extrication equipment. Members of the Michigan-Whitman Fire Department accept a check from Bayer CropScience and InVigor canola as part of the More for Everyone program. This rescue equipment is something you hope you never have to use, but if you need it, you better have it. Fire protection and services provide a vital service to communities, and this extrication equipment will be a valuable safety precaution. The next time alarms sound in the Michigan-Whitman Fire Department, its volunteer members know they are a little better equipped to handle on-farm emergencies, thanks to a $5,000 award from InVigor canola from Bayer CropScience. 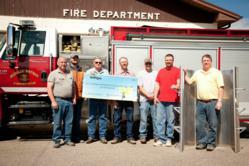 The fire department will purchase a set of rescue grain bin tubes with the More for Everyone award from InVigor canola. The tubes are used to extricate a person who has been buried under grain by the pull of an auger, a wall or pile of grain that has caved, or falling through a crust formed by wet grain. Without the right rescue tools, engulfment often leads to suffocation. The Michigan-Whitman Fire Department received the award June 14 at 10:30 a.m. at the Wagon Wheel Café in Michigan. Representatives from Bayer CropScience joined area canola farmers to present the award. The award is one of 12, with donations totaling $32,000, going to non-profit organizations across the state this year. In the program’s three-year lifetime, Bayer CropScience has awarded more than $87,000 to local groups nominated by canola farmers. View additional photos on FlickR! Bayer is a global enterprise with core competencies in the fields of health care, nutrition and high-tech materials. Bayer CropScience, a subgroup of Bayer AG with annual sales of EUR 7.255 billion (2011), is one of the world’s leading innovative crop science companies in the areas of crop protection, non-agricultural pest control, seeds and traits. The company offers an outstanding range of products and extensive service backup for modern, sustainable agriculture and for non-agricultural applications. Bayer CropScience has a global workforce of 21,000 and is represented in more than 120 countries. This and further news is available at: http://www.press.bayercropscience.com. 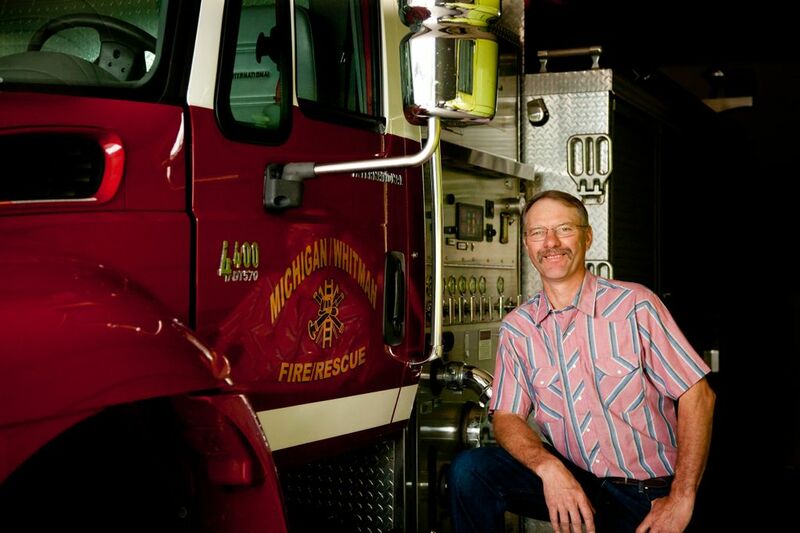 InVigor John Steffan - Grower and FiremanThe Michigan-Whitman Fire Department will purchase a set of grain bit tubes with More for Everyone award from InVigor canola from Bayer CropScience.